Purchased by exchange and bequest of Mrs. Herbert N. Straus, 1985. 6 leaves : vellum, ill.
London, Christie's, June 30, 1971, lot 93; Everett and Ann McNear, Chicago. 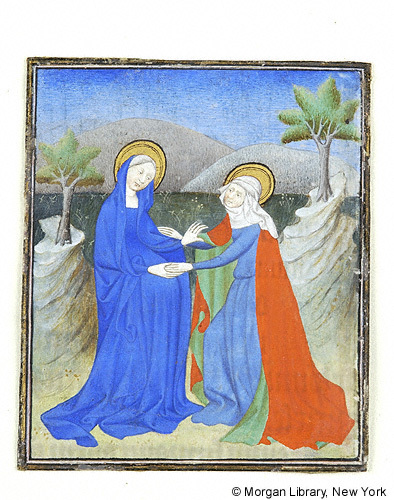 Six leaves from a book of hours, written and illuminated in Paris, France, ca. 1400-1410. Artists: three artists; two miniatures probably by the Master of Berry's Cleres Femmes (3, 5) and three miniatures probably by the Master of the Coronation of the Virgin (2, 4, 6). M.1068.1: Hours of the Virgin, Lauds (incomplete); 4 illuminated initials, 2 illuminated line fillers. M.1068.2: Hours of the Virgin, Lauds (incomplete). M.1068.3: Hours of the Virgin, Tierce (incomplete); 4 illuminated initials, 2 illuminated line fillers. M.1068.4: Hours of the Virgin, Tierce (incomplete); 3 illuminated initials, 2 illuminated line fillers. M.1068.5: Hours of the Virgin, Nones (incomplete); 3 illuminated initials, 2 illuminated line fillers. M.1068.6: Hours of the Virgin, Nones (incomplete); 5 illuminated initials, 3 illuminated line fillers.